Something was missing: he drove home every weeknight to a quiet, empty house. Jonathon West is a mailman afraid of dogs: he's an office mailroom supervisor, but a childhood attack left him nervous of man's best friend. The office charity committee nominates him to drop off a donation at the animal shelter, an act that takes all his courage. For his pains, openly-gay Jonathon is rewarded by meeting Dylan Pond, the most gorgeous man he's ever laid eyes on. The connection is instant, and Jonathon finds himself drawn back to the animal shelter volunteer's eyes and arms. Since promising himself he wouldn't date bratty young men, Jonathon's been lonely for too long. 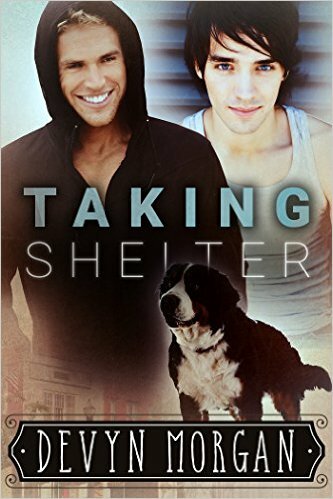 As Dylan and Jonathon fall for each other, the shelter gets an urgent call. Chemistry isn't enough without commitment. It's time for Jonathon to decide if he can put aside his fears and loneliness to embrace all he's offered. Taking Shelter is a standalone gay romance with a HEA ending. I’ve been entertaining myself with my new Kindle unlimited subscription, nibbling here, sampling there, feeling pretty free to check out whatever I want without bankrupting myself when I found an author that I’ve been gobbling like potato chips. First one, then another, then one that was a little weird, but… try again. I had to keep reading! Devyn Morgan is addictive. Okay, some of the stories are better than others, but all are definitely on the fun side, short, happy, the sort of thing that makes you feel better about waiting at the dentist’s, where I admit to reading two of them. I haven’t finished the catalog yet, and this author seems pretty prolific, so I bet I have more goodies in store. These are romance of the not angsty sort, where the obstacles aren’t insurmountable, and happiness is just around the corner. This one seems pretty representative, with a not quite mailman who’s frightened of dogs but attracted to the handsome shelter volunteer who had lots of dogs who need homes. Each of them has to bend a little, and with the other’s help, can get what they each want plus each other. Sometimes you just need something to make you happy, with a story showing men with kind hearts and good intentions bumble around a little (and smex up a bit too!) and find each other and love. This story is definitely running light on conflict and heavy on the feels, and ends in a great big happy sigh.